1Place cumin and coriander seeds in a frying pan and cook, stirring, over low-medium heat until fragrant. Cool. 2Place cooled seeds in a mortar and crush with a pestle to form a coarse powder. 3Using a food processor or blender, process or grind chickpeas until finely chopped and almost a paste. Transfer to a bowl. 4Add ground spices, garlic, herbs, onion and salt and pepper to taste, then mix well. Stir in flour, bicarbonate of soda and egg until well combined. 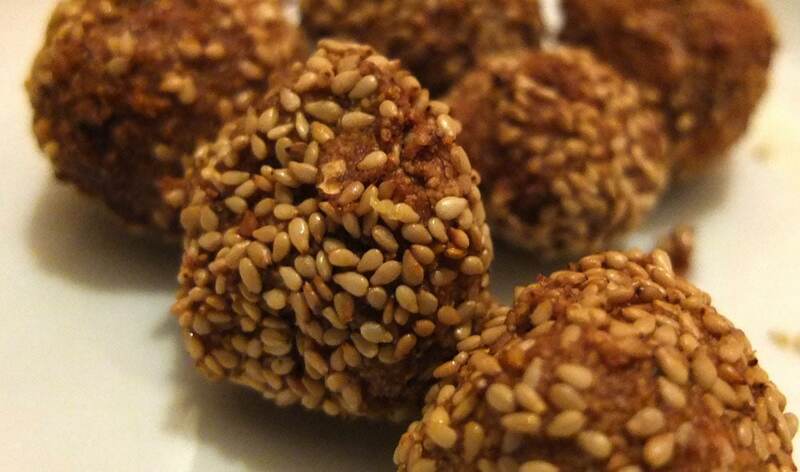 5Roll tablespoonfuls of mixture into walnut-sized balls then roll in sesame seeds to coat. Place on a tray. Cover and refrigerate for 1 hour (or overnight) to firm. 6Pour oil into a large, deep frying pan until 5cm-deep. Shallow-fry falafel in batches, turning until golden all over, then drain on paper towels. 7Serve with tarator sauce and lemon wedges.